Spring is finally here! Which means the days are longer, the weather is warmer and the sun is shining! It also means that after all these cold and dark months, we can finally spend more time outside and wearing less layers. This usually makes me realise that all the lovely warming comfort food I had during the winter, might have left me with some extra pounds. Luckily, with this bright weather my body doesn’t crave such heavy food anymore, as I tend to eat more fresh fruit and vegetables. Eating more fresh and nutritious seasonal produce can also help our bodies recover from the winter months, losing those unwanted extras and preparing us for a healthy and energetic summer. I’ve been loving these amazingly warm and sunny days recently and mostly craving some bright and colourful fresh foods which has inspired me to come up with some spring salad creations, I would like to share with you. 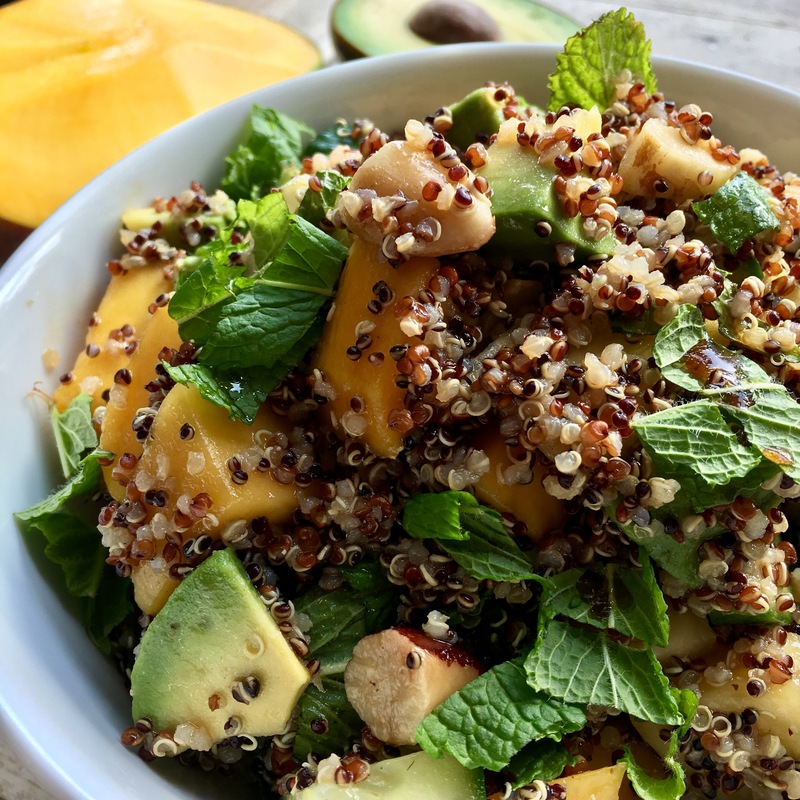 I’ve been experimenting with putting fruit in my salads, which may sound strange at first, but don’t be afraid to try it as they work gorgeously together with fresh veggies and wholesome grains. 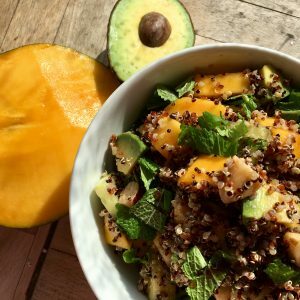 I’m going to share with you one of my newest and favourite recipe, a Mango, Pineapple and Avocado Quinoa Salad. This salad is gluten free and vegan so can be enjoyed by anyone as either a main or a side salad. Mangoes are incredibly nutritious and loaded with antioxidants, which protect against cancer. They alkalise the body, aid weight loss, and their high level of fibre helps digestion. They are rich in vitamin C and vitamin A which strengthen the immune system and promote healthy eyes. Mangoes also contain enzymes which help in breaking down proteins. Pineapple is also a good source of vitamin C and manganese, a mineral essential in some of the enzymes necessary in the body for energy production and also to build healthy bones. One of the most important enzymes in pineapple is bromelain which holds the key to many of its health benefits and which it is most famous for. 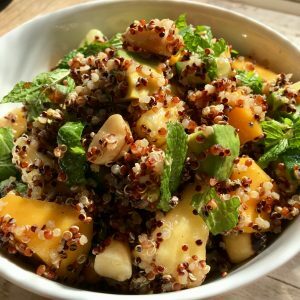 Bromelain is anti inflammatory and a unique protein digesting enzyme, which makes meat and other concentrated food proteins much easier to break down and digest. 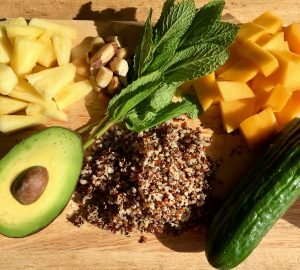 As I’ve already mentioned in my previous post, avocado is incredibly nutritious, loaded with healthy fats, fibre and various important nutrients. They are actually one of the few high protein fruits and it’s a good quality protein. 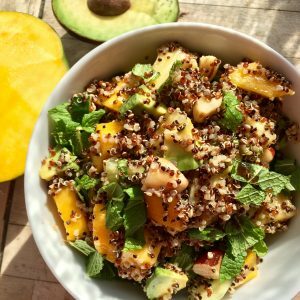 Quinoa is one of the world’s most popular health foods. It is gluten-free, high in protein and one of the few plant foods that contain all nine essential amino acids. It is also high in fibre, magnesium, B-vitamins, iron, potassium, calcium, phosphorus, vitamin E and various beneficial antioxidants. I have also used brazil nuts in the salad, which are a nutrient dense and delicious type of nut. Some of their most impressive and important health benefits include their ability to help stimulate growth and repair, improve the digestive process, boost heart health, balance hormone function, improve the immune system, lower risk of cancer, boost male fertility, help with weight loss, aid in skin health, and reduce the signs of aging. These measurements are just to give you an idea, but you can use as much of the ingredients as you prefer them. All you need to do, is to prepare all the ingredients, then mix them in a bowl with the dressing. And there you have it, an exciting, bright, nutritious and filling salad, which you can enjoy any time of the day!